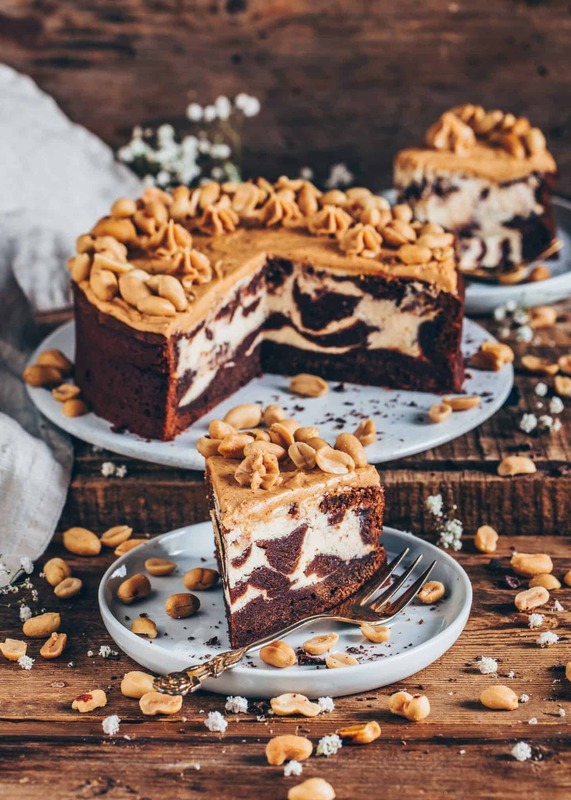 If you love chocolatey brownies and creamy cheesecake, this vegan brownie cheesecake will be your new favorite dessert! It’s moist, rich, can be made gluten-free, and it’s topped with a delicious peanut butter frosting! 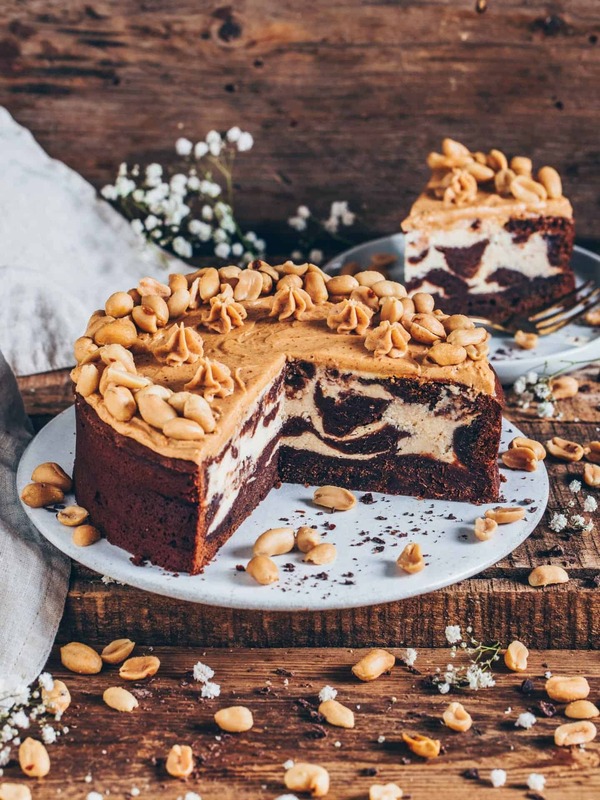 The perfect vegan cream cheese swirl brownies as a chocolate cake for any time! For some reason, I get chocolate cravings more often on cold and cozy winter days. Does anyone else feel the same? I mean, I really love Christmas treats that are spiced with cinnamon and fall flavors, but honestly, I can’t eat them all the time. So I decided to make easy vegan chocolate brownies but swirled with a creamy cheesecake layer in a brownie cake! Anyways it turned out so good that it’s definitely a must try! 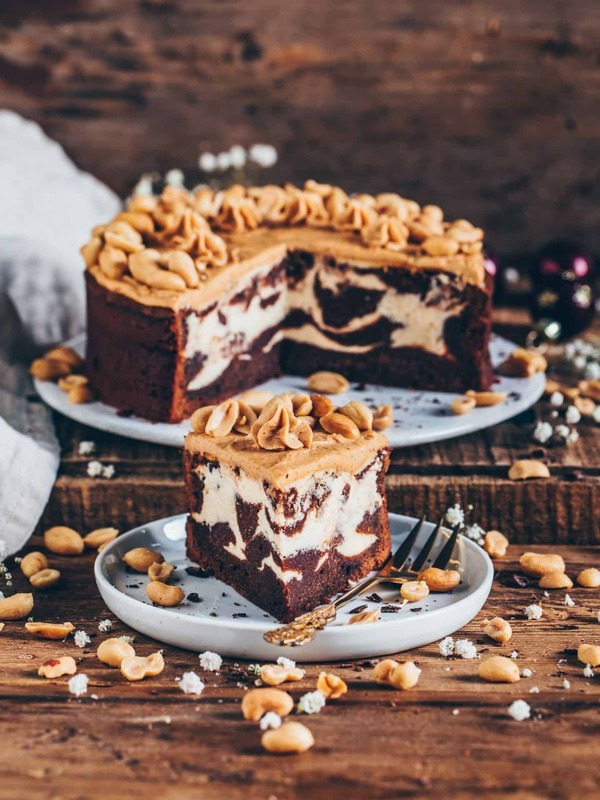 This delicious Vegan Brownie Cheesecake is inspired by my vegan pumpkin cake with cheesecake swirl. It looks quite similar (except the color and toppings) but it tastes totally different. While my pumpkin cake is loaded with warming fall flavors and spices, this brownie cake (chocolate cake) is just loaded with lots of chocolate. I’m pretty sure it will definitely satisfy your chocolate cravings! 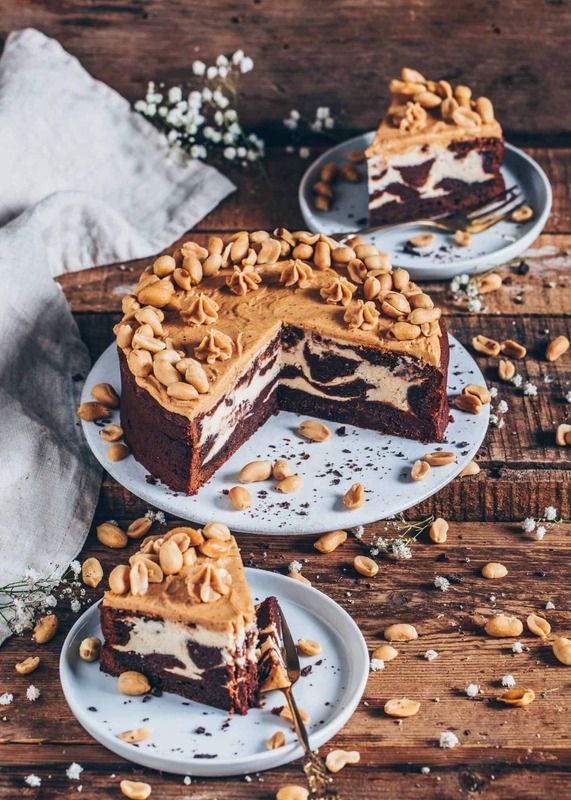 Actually, this brownie cheesecake is just a combination of vegan brownies and vegan cheesecake. So it’s a kind of vegan version of cream cheese swirl brownies as a chocolate cake. 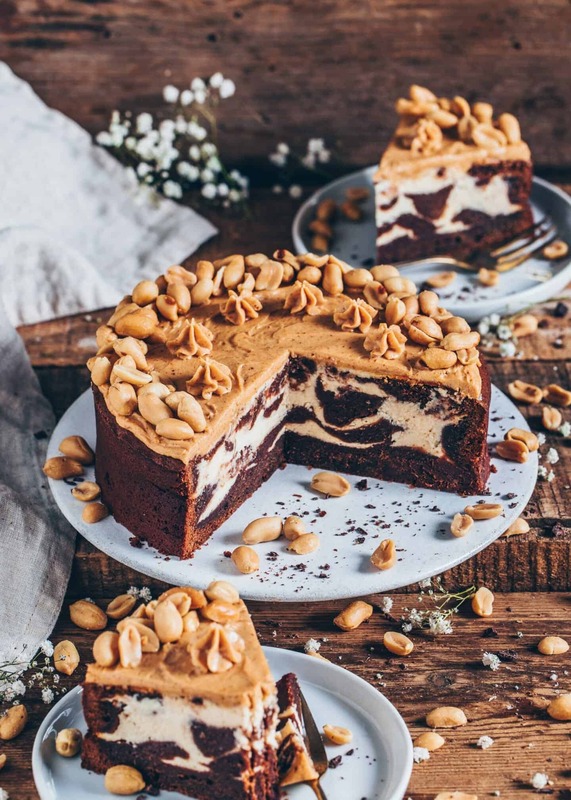 Also, it’s topped with a creamy peanut butter frosting which makes this cake even more tasty! 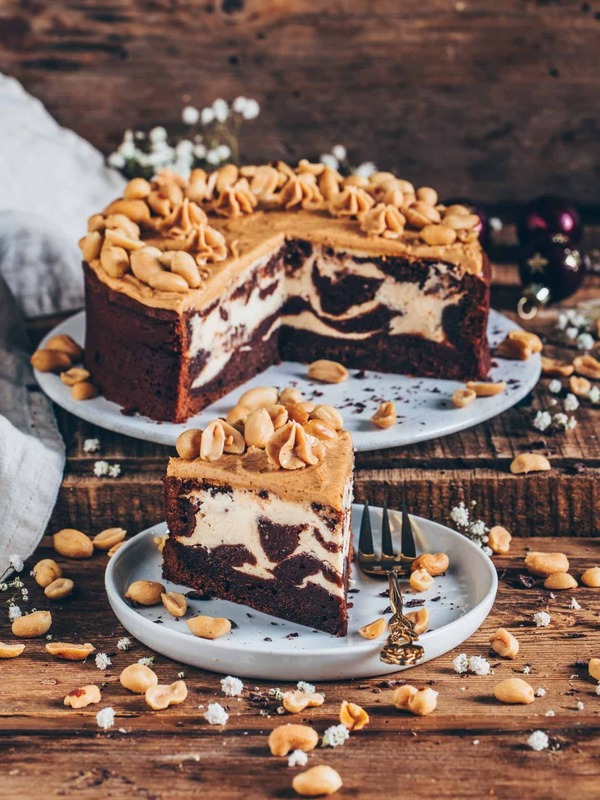 This vegan Brownie Cheesecake is very easy to make! What I really love about this recipe is that it’s not only super delicious but also very easy to make! You only need two bowls and a few simple ingredients. In one bowl, mix the ingredients for the vegan brownies and in the other bowl mix the ingredients for the vegan cheesecake. Then using heaping spoonfuls simply layer the chocolate brownie batter and the cheesecake batter into a greased baking dish. You don’t have to put in much effort because it doesn’t have to look perfect. I mean, the prettiest swirls for a marble cake are created by accident, right? 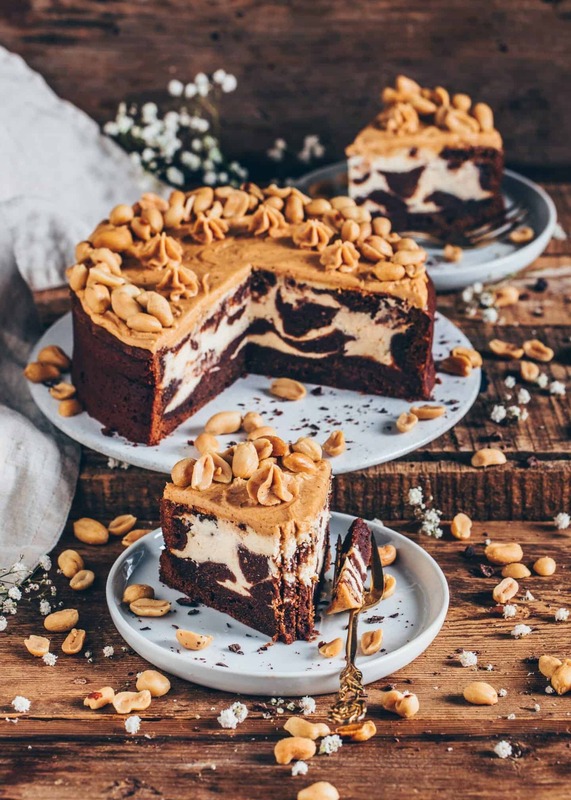 Make Vegan Cream Cheese Swirl Brownies with this recipe! 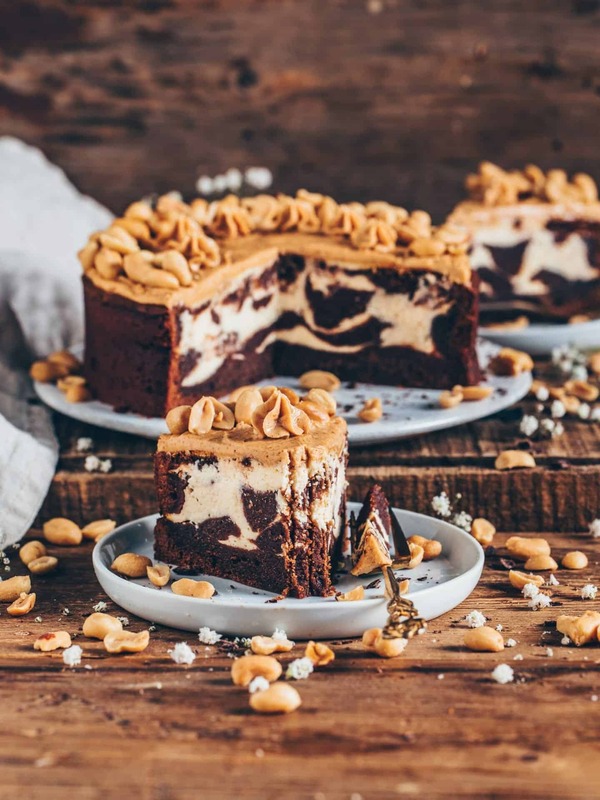 As I mentioned before this vegan brownie cheesecake is actually made of chocolatey vegan brownie batter, which makes a moist, rich and dense texture. Which means you can also make vegan brownies with this recipe. Simply bake it in a baking dish or brownie pan instead of using a round springform. Also make sure to reduce the baking time to 30 minutes, if using a bigger baking dish, such as a 9×9 inch, because the brownies are done faster when the batter isn‘t layerd so high. Then you’ll have tasty vegan cheesecake brownies in a few minutes! 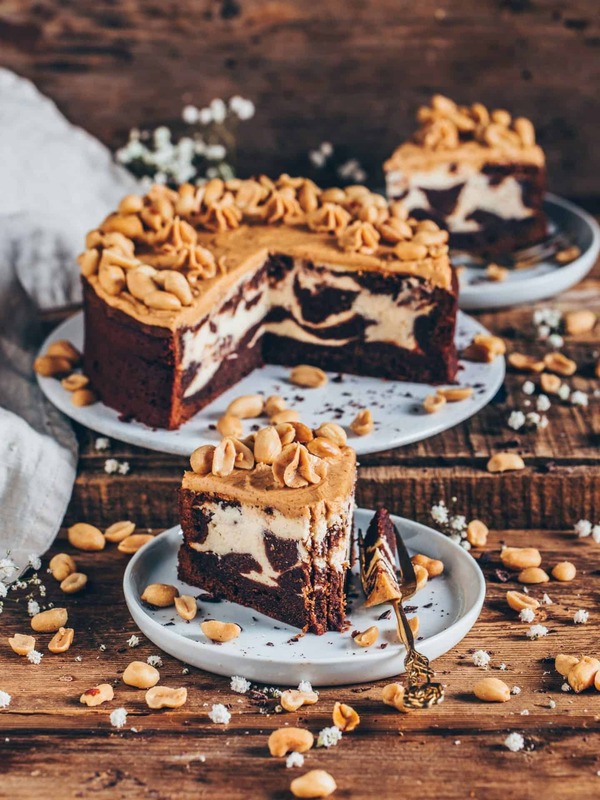 This Brownie Cheesecake is the vegan version of cream cheese swirl brownies, but as a cake! It’s moist, rich, gluten-free and topped with a delicious peanut butter frosting! Prepare the flax eggs by stirring 2 tbsp ground flaxseeds in 5 tbsp of hot water. Allow to sit for 5-10 minutes. Add all ingredients for the cheesecake in a mixing bowl and blend until creamy using an electric hand mixer. Melt the vegan butter and chocolate in a pot. Stir in vanilla. Mix the flour with salt, baking powder, baking soda and sugar in a bowl. Add the flax eggs and melted chocolate butter and mix until combined. The batter should be creamy. Add a little bit more of plant-based milk, if needed. Spread 1/3 of the brownie cake batter into a greased 7-inch (18 cm) round baking tin. Continue dollop the cheesecake batter and the brownie batter by a heaped spoonful in exchange until the batter is empty. Bake for about 50 minutes, (or until an inserted tooth pick comes out almost clean). Then let cool completely. Blend all ingredients for the frosting using an electric hand mixer until smooth and creamy. (Add a little plantbased milk if it’s too firm). To make this cake gluten-free, you can use a gluten-free flour blend 1:1 instead of all-purpose flour. To make this cake sugar-free you can use erythritol instead of regular sugar. Instead of flaxseed eggs you can use 100 g applesauce or one mashed banana. I recommend you to add a little less sugar then. You can keep leftovers covered in the fridge for up to 4 days or freeze. 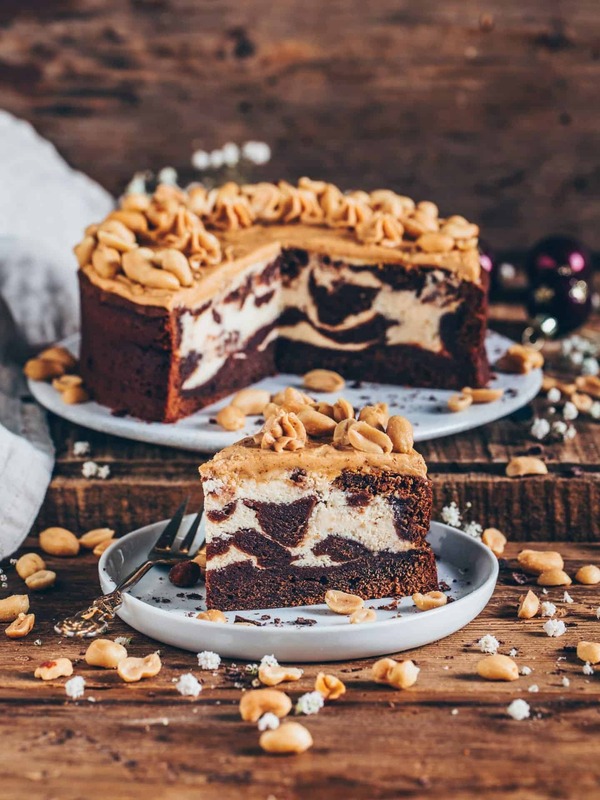 I am probably the biggest fan of brownies and this brownie cheesecake looks spectacular! I am sure I would eat the whole cake in one sitting lol! Looks fab! So glad that you like this recipe. For the frosting, are the measurement correct? I tried making it and it ended up a sloppy, running icing rather than a frosting. Not sure of you meant teaspoons rather than tablespoons in your measurements? I will definitely make again but with my own frosting mix! Hi, I‘m sorry that it was not clear enough when to add these ingredients exactly. Anyways, it doesn’t matter when you add the vanilla extract and sugar. I usually stir vanilla into the melted chocolate mixture, and mix the sugar with the flour. The plantbased milk is just an optional ingredient if the consistency is too firm and not smooth (it always depends on which kind of cream cheese or yogurt you use, if it’s liquid or more firm). The same happens to the Frosting. It’s very important to use creamy peanut butter, because the regular peanut butter makes a runny texture. The milk is also just an optional ingredient, depends on the texture. I hope it will turn out better next time. Let me know if you have still any questions. Hi! I’m just here to say thank you so much for the recipe! I just cooked it the last evening and now that I’ve tried it it’s so delicious! The combo is bomb! Hope to make even more recipes of yours soon!